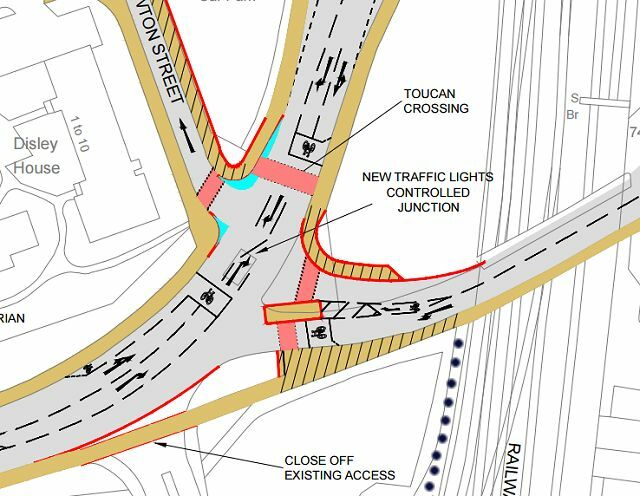 Work is now in progress on the 'TCAP' project to change Booth Street railway bridge from one-way to two-way, removing the existing westbound cycle lane. Above as a detail of the plan published on the Council website. (The diagonal hatching marks shared paths.) 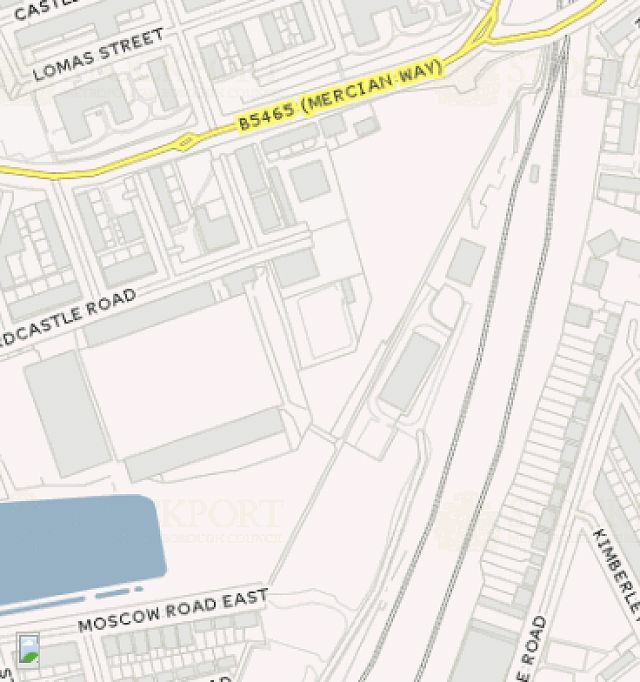 We have added the black dotted line which shows the path to Moscow Road East which is being improved. 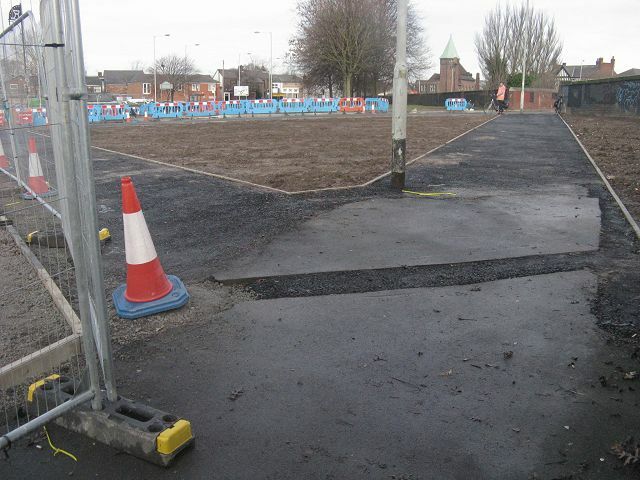 The Council say that 'A cycle route will be provided to link the path to Moscow Road East to Newton Street.' This move, currently simple enough using un-signalled refuges, will now involve negotiation of at least three signalised crossings, only one of which is marked on the plan as a 'Toucan' but perhaps all will be. 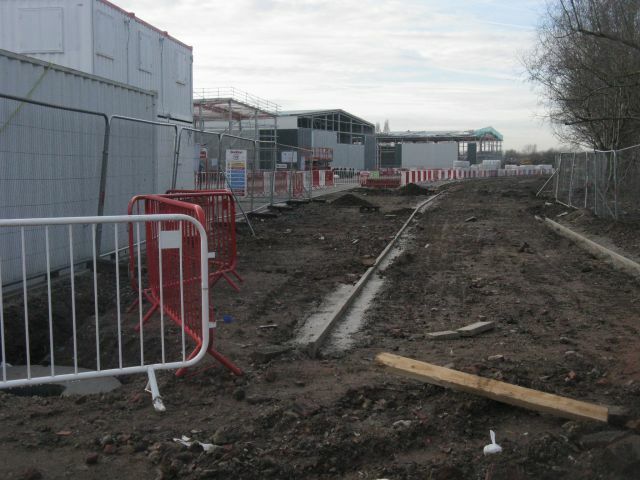 The picture above shows the situation in December 2016 from Booth Street, looking across Mercian Way to Newton Street and hence the shopping area, railway station, and route to the town centre via the Thompson Street footbridge, looking from a new pathway not shown on the plan. 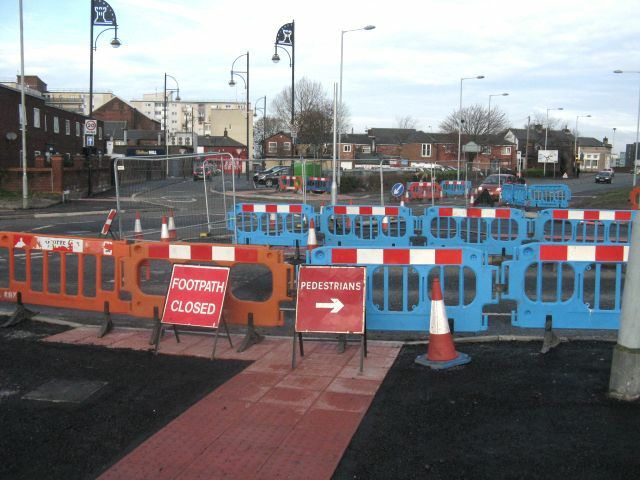 The red tactile paving does not incorporate the ribbed tiles usually associated with cycle routes. 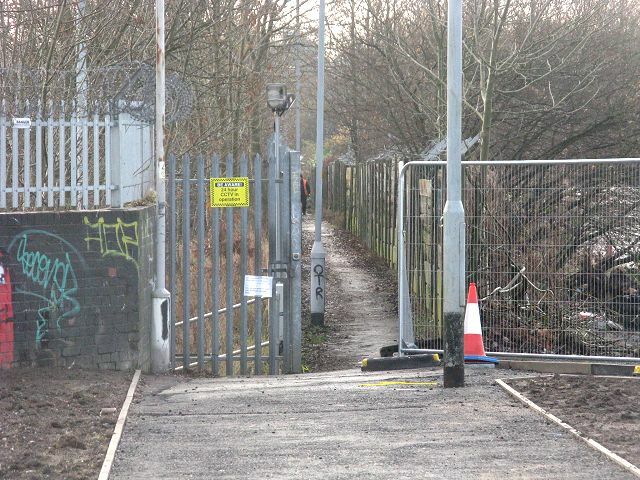 Taken from further back at the entrance to the Moscow Road East path, shows a choice of pathways, one (right) on a 'straightened-out' version of the afore-mentioned route, for the use of people who have passed over the railway bridge, and a route (left) which leads to the crossing in the first picture. Turning through 180º we see the Moscow Road East path, which is to be improved as part of the scheme including 'widening, surfacing, fencing and lighting to allow pedestrian and cycle use.' Clearly, this work has yet to start. The remote-controlled gate on the left leads to the Network Rail depot and signalling centre; years ago, schoolboy spotters would sneak down to the steam locomotive shed. 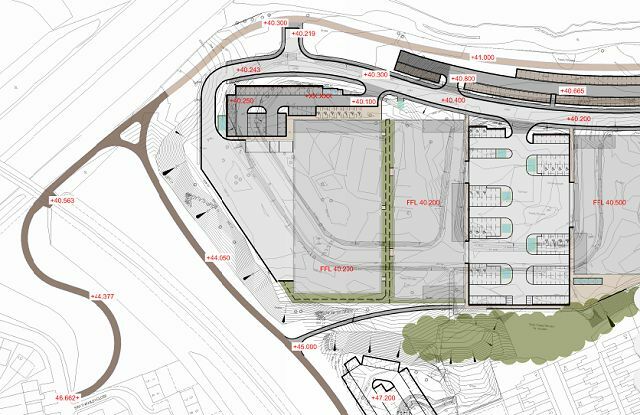 The area to the right, once a council depot and lately used for parking and car-boot sales, is to be re-developed. 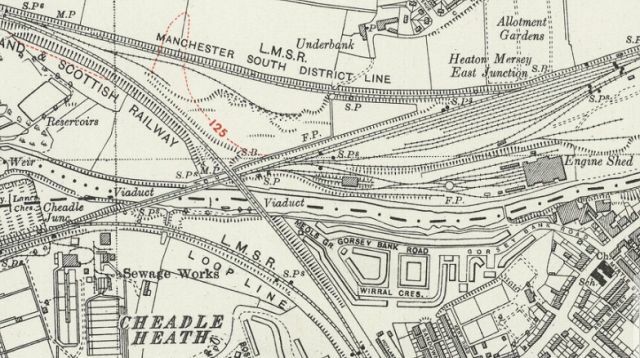 An oddity about this path is that although it clearly exists - as a straight line on the Council's map - and is used, running behind Edgeley Park football ground and crossing the route of the former railway siding which served Sykes Bleachworks, it has never been designated as a public right of way. Presumably the land is owned by the Council so it is administratively easy to allow cycling. The solid concrete fences are to be replaced by open palisade ones to make people feel safer, but will anyone use it at night even with lighting? 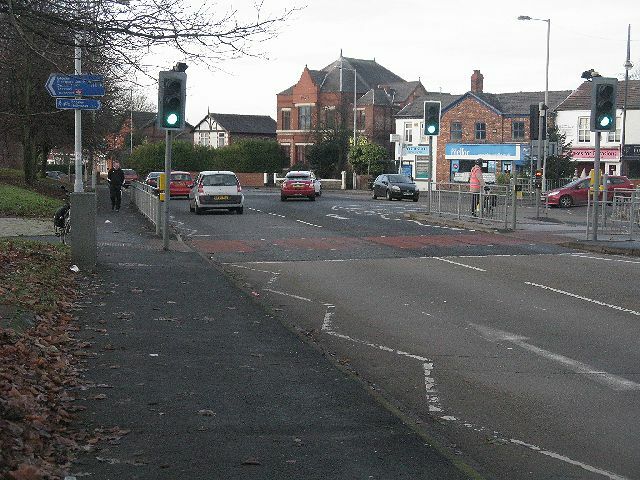 Further down Mercian Way is this Toucan Crossing connecting the end of Castle Street shopping area and a link via Grenville Street to the Trans Pennine Trail (to the right) with a signed route towards Davenport via Reservoir Road. Wouldn't it be useful, though, if there was a dropped kerb and a short length of shared path in the foreground for the benfit of anyone who reaches this point via Booth St and Mercian Way. This just one of the places in Stockport where such would be useful. An obvious other example is the left turn into Edward Street from Wellington Road South where it would give access to the Toucan Crossings. Gingerly down Grenville Street and on to the TPT, we paused to cross the Gorsey Bank bridge to look and progress in creating the oddly-named 'Aurora' business park. The building of the industrial units is well under way; this view is from just above the river footbridge. We understand that a shared path will be provided along here. This map extract from the Planning Permission (ref. 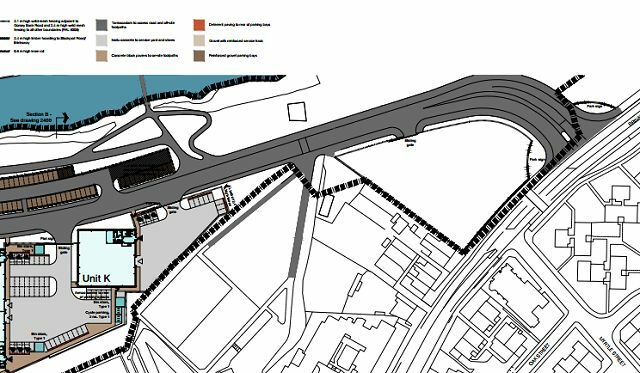 60052) shows what the area near the bridge will look like, with the link to the off-site footpath towards Cheadle Heath. 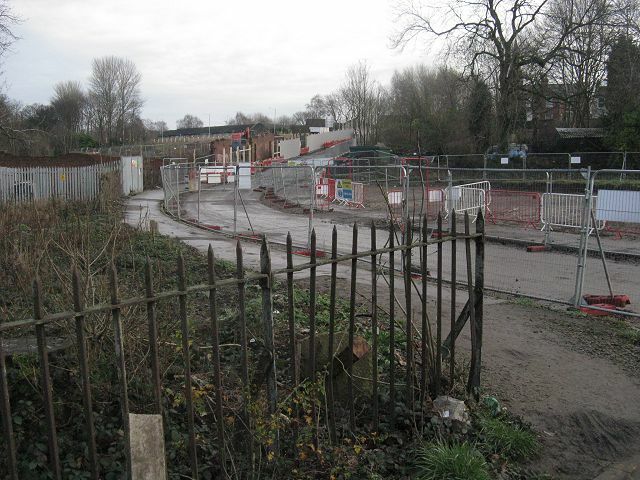 Temporary access to the bridge is being maintained, but the original Gorsey Bank road which led to the former housing estate will apparently not be the final route, which will emerge on to Stockport Road slightly nearer to the town centre. This plan shows the route of the path at the other end of site, with the link under the railway line. As a historical sidelight, this map shows what existed c.1952. The original footbridge at Gorsey bank was built for railway workers to access Heaton Mersey engine shed. The only railway in existence today is the 'LMSR loop line' which is used by stone trains to and from the Peak District trains a few times each day.